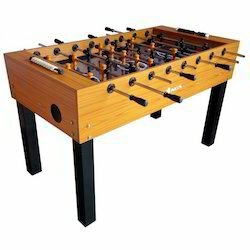 KTR Soccer table is manufactured with fine wood material and is provided with iron legs to provide durability to the soccer table; KTR Soccer table is designed to provide stability easy to use, carry and store. This is recommended for indoor use. Metco does not provide MDF board material which spoils the life of the table. Assembling to be done by buyer. 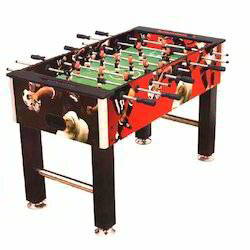 Made of High Grade Board & Iron Legs. 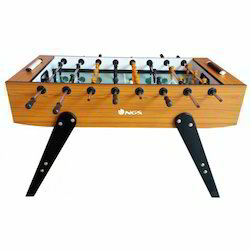 Size 85" x 43" x 32"
Legs: Sturdy Legs of MDF, with additional chrome steel bar. Leg levelers: 13cm chrome plated. 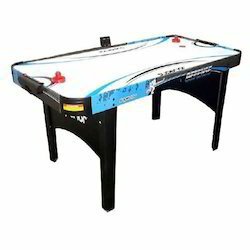 Table dimensions: 55"x 29"x 35"
Gross Weight : 54.9 kgs. Player rods: 16mm strong chromium steel. 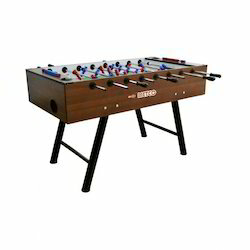 Size 61" X 30" X 32"
KTR Soccer table is manufactured with fine wood material and is provided with iron legs to provide durability to soccer table, KTR soccer table robust is designed to provide stability easy to use, carry and store. This is recommended for indoor use. Metco does not provide MDF board material which spoils the life of the table. Assembling to be done by buyer.